Join the CEOs of Government at our 17th Annual CME Stakeholders’ Dinner. 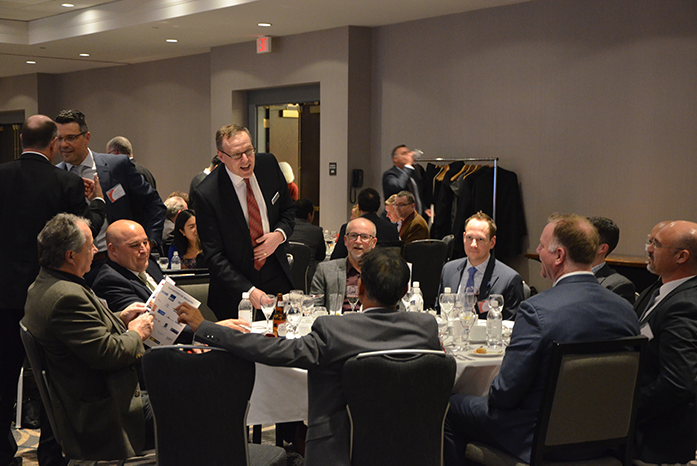 This is an exclusive dinner where over 100 senior executives from the manufacturing sector will meet and dine with key government decision makers, BC’s Deputy Ministers and the heads of Crown Corporations. These unique round table discussions create an environment where successes and challenges can be shared, ideas can be exchanged, and the future of manufacturing formed. Through the course of the evening, manufacturers will have an opportunity to meet with a number of key government stakeholders and peer manufacturers. This section wil be updated as participation is confirmed. Check back weekly! • Each manufacturing company and sponsors will have their logo and profile featured in the dinner program. • Only available for purchase until February 15, 2019. • Networking Table from 3:30 – 5 p.m.
A preferred room rate of $189/night is available for guests.